Feeling let-down after Christmas is pretty normal. When you've spent weeks preparing for the big event and looking forward to seeing far-away family, having it suddenly be over leaves a big hole. Plus, you may be feeling a bit lonely if loved ones have been here and now they're gone again. Feel5ive just to help me get back on track. Then I make myself get busy with house cleaning, catching up on projects, and setting some goals for the coming year. All that takes some focus and concentration, which means I don't have time to feel sorry that I can't keep my kids at home for the rest of their lives. If your feelings are a little more extreme - as in true distress because you can't be with them and assuring yourself of their safety at all times - you might want to try the Bach Flower Essence Chicory. First read about how Chicory can help you, then go to Feel Bach! to place your order. Chemical products flood the market, but if you have an aversion to pharmaceuticals and worry as much about their side effects as you do about smoking, I have good news - FeelBach! has a flower essence blend to help you keep that resolution. Quit Smoking is the FeelBach! blend that will gently re-balance your energies and allow you to keep your resolve to stop. both for health and financial reasons - but of course it isn't easy. You might need a little help. The thing is, smoking is not just an addiction to nicotine. Nor is it just a habit. If you're like many others, smoking is a part of "who you are." You identify yourself as a smoker – you may even smoke as a form of standing up for "who you are" against those who say you "must not." Changing our own ideas of who we are can be a wrenching emotional experience. Quit Smoking will help you overcome all three of these reasons why you smoke. And at only $7.95 per bottle - it's much more cost effective than a therapist! While some are eagerly shopping, baking and decorating, others are dreading every bit of it. "Bah-humbug" is their motto. If that's you, why not turn it around - take control of the situation so you can enjoy the season. First, determine what it is you dread. Sit down with yourself and really think about it. Then make changes. If you take on too many projects, decide which ones you don't enjoy and drop them! Say no to anything that doesn't bring you joy. If money is the problem, remember that the season is about good will – you don't HAVE to spend a lot of money to spread that around. So don't over extend. 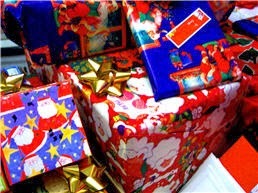 Give gifts of your time and attention instead. If you're going to face people who always bring you down, stop and feel sorry for them. The reason they're bringing you down is that they aren't so happy themselves. Then either decide not to spend time with them, determine to ignore them, or get bold and call them at their game. If you're lonely, look around you. Someone else is lonely too, so reach out. Meanwhile, do some things to lift your own spirits. Get outside and take a brisk walk - the exercise is energizing and clears your head. Turn on music you love and sing along at the top of your lungs. Even better, get up and dance while you sing - you'll be amazed at how good that feels. Schedule time with a favorite friend for shopping and lunch. Set aside some one-on-one time with kids, parents, spouse, or anyone else who is important to you. Sit down and make a list of things you're thankful for. Taking time to give thanks each day gives you a better attitude and helps kick the Law of Attraction into action to bring more of those good things into your life. Decide now to turn your focus to the good things in your life. If your self-examination revealed some emotional issues you need to deal with, go to Feel Bach! and take the questionnaire. Then get the Bach flower essences blend that's indicated and remember to take it. You deserve to feel good - and to enjoy the Holiday Season just as much as anyone else. It's not selfish - because the better you feel, the better the people who love you will feel. So get busy - do something for you today. It's the Holiday Season - is it marred by a damaged relationship? Sometimes the best relationships can be marred by some small misunderstanding or disagreement. If not nipped in the bud, it can escalate - just get larger and larger until you find yourself in a place you don't want to be. It could be with a child, a spouse, or even a parent. One of you becomes angry, the other reacts with more anger, and it just keeps going back and forth. The first step in healing is to get your own feelings under control, so your own reactions can change. That change will often cause a positive change in the other person. The first thing you need to do is really examine your own feelings. Look at yourself as you think others might be seeing you. Do they see a person who is controlling, one who can't let anyone else be right, or maybe one who is afraid of change? Then think about what feelings you have that are contributing to that image. Then go to the questionnaire at FeelBachand be completely honest filling it out - even if it feels painful to face truths about your own behavior. Remember, this isn't being broadcast to the world - this is you talking with you. When you see what blend is recommended for you, take a look at the individual essences and read what they'll do for you. Then, if you're committed to healing the relationship, get your blend and let it begin working on your energies - so the next time you feel attacked by that other person you can respond from a better place. You should soon see that your changed reactions will cause a better reaction from them - and it should get better and better until your relationship is back on a track of love and understanding. Relationships with those we love are too precious to let them fall by the wayside when there are simple ways to save them. Are You Losing Sleep Over the Busy Month Ahead? For many, December is a month of hectic activity - with the feeling that there's simply not enough time to do it all. And then, when you need your rest the most, you begin to lose sleep because you're worried about what didn't get done today and what more needs to be done tomorrow. Turn to FeelBach's Sweet Dreams #1. This is the formula that lets you relax, release the day, and drift off into peaceful, restful sleep. If your mind just won't shut down, try Sweet Dreams #2. 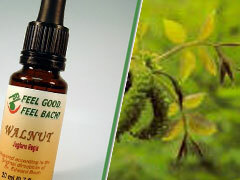 Both of these formulas let you relax and sleep - and wake up without the groggy after-effects that sleeping pills cause. Plus they're safe - you won't have worries about getting up in the night to go for a drive when you're asleep. They're also safe from a physical standpoint - you don't need to worry about dangerous reactions with other medications you might be taking. When your body is well-rested you're more able to cope, to juggle tasks, and to keep your good humor throughout it all. So if you're beginning to lose sleep, visit FeelBach! for your own bottle of Sweet Dreams. Labels: Bach essences sleep formula , natural sleep aids , Sweet Dreams from FeelBach! Does the Thought of Thanksgiving Dinner Have you in a Knot? While family get-togethers can be fun, they can also be the source of great anxiety. If you're the cook, there's the fear of criticism from others who "could have done it better." Even if no one in the family would say a word, you could feel insecure and worried. If you're a guest, you can suffer a similar anxiety - if reconnecting with distant family members brings fear of criticism. "What if Cousin Joe is doing better in his career than I'm doing in mine? Will he taunt me about it?" Maybe there's a family member who is known for cutting remarks - and you know you'll have to face him or her. What if the state of today's economy has caused you to lose that job - and perhaps even your house? If you're dining with successful family members, it's natural to have some feelings of inferiority. 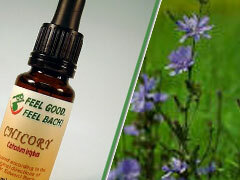 For you, Centaury and Larch can bring welcome relief from feelings of inferiority. Go to FeelBach! to order them today, so they'll be in your hands in time for Thanksgiving. Are some of the loved ones on your gift giving list young people who are just going off to school or just stepping into new careers? If so, consider a gift of Feel5ive, because as exciting as those changes are, they ARE stressful. For youth this is a time of "proving yourself" - and of being unsure whether you can measure up to all your own expectations. It's a time of being afraid to say the wrong thing or to look foolish in the eyes of other students, professors, co-workers, employers - or potential employers. So give your loved one Feel5ive - and then talk to them about how perfectly natural it is to feel stress in those new situations. Tell them about the times Feel5ive has helped you stay calm in fearful situations. I'm not a youth and don't have those situations to face - but I take Feel5ive before visiting the dentist (Big fear there!) and before going out on icy roads. Gift-giving season is almost upon us, and if you're like most of us, you're trying to think of something "just right" for a few people who already have everything they need. Do those folks have pets? If so, FeelBach's pet formulas might be the perfect gift. Home Alone was created for pets with separation anxiety - and is also useful for "normal" pets who simply become upset when their humans stay away too long. My own pets are fine when I leave for a few hours, but get upset if I'm gone for more than a day. Home Alone helps them cope. Thunder Storms is for pets who are terrified of loud noises - whether it's thunder, fireworks, or gunshots. Long before I learned about Dr. Bach and the flower essences, I've had two dogs who would go into a panic over a thunderstorm. I felt so sorry for them, but there was nothing I could do to comfort them. Of course - I should be thankful. One of those dogs was a stray who came to us because of a thunderstorm - she tore the screens off the door to get into the house and hide under a bed! She was a wonderful companion and we were glad to keep her. Feel5ive for Pets is helpful any time a pet is under stress. It may be a visit to the veterinarian, it may be a new addition to the family, it may even be the death of a loved one - whatever the cause, Feel5ive for Pets will help them just the way Feel5ive helps humans. If you stop to think about addiction, you know that it is not just a physical ailment. It's emotional as well - and that's why so many smart practitioners use Doctor Bach's Flower remedies as a part of their overall addiction treatment. We don't know the reason why some people are more prone to addiction than others, but we do know that any destructive behavior is a sign that our energies are out of balance. We've somehow lost touch with our higher selves. Each of the Flower Essences works to re-balance those energies and put us back in touch with who we were meant to be. If energies aren't put back in balance, the patient has a high possibility of failure, because the "rehab" isn't complete. I find this sad, because Flower Essences are both inexpensive and easy to use. I think of a man I once knew. He said he had spent a month in rehab, and all he could think of the whole time he was there was getting out and finding a bar. They may have gotten him sober and "dried out" but they did nothing to cure the emotional upheaval that caused him to crave the comfort of being drunk. Which essences aid in treating addiction? Walnut and Rock Rose. Walnut is the Flower Essence that helps in dealing with and embracing change - and what could be a bigger change than stopping a daily habit? 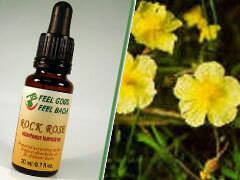 Rock Rose helps us overcome fear - and we all know that letting go of habits and routine is fearful. Even while destructive, a habit is like a security blanket we can pull around us when outside forces threaten. If you're struggling with an addiction – whether it is to tobacco, alcohol, drugs, or even food, you'll have a much easier time in overcoming it if you get your energies back working for you instead of against you. The financial cost is small – and the lifetime benefits large. So come to Feel Bach! and get started. Can You use Doctor Bach's Remedies if You're Sensitive to Alcohol? When you read the history of Dr. Bach's Flower Remedies on the Feel Bach! site, you’ll see that the flower essences are preserved in spring water and Brandy. While other flower essence distributors use grape alcohol, we use the same formula that Dr. Bach perfected all those years ago. The amount of brandy compared to the spring water is minuscule – 1 to 360 – or less than three tenths of one percent. But still, although there is not enough alcohol to do harm to infants, the ill, or the elderly, you can taste the brandy in this formula. And I've talked with people who were afraid to purchase it for a loved one who suffers from alcoholism because the mere whiff of alcohol could set them off on a binge. So if you’re sensitive to alcohol, or if you’re buying for someone who is, go to http://feelbach.com/qto.asp to build a personal formula. Then, in the last step, write “alcohol-free” in the comment area. If you own the set of Bach Flower essences and are making a formula for someone, use only 2 drops of each essence in the 20 or 30 ml bottle, and fill with spring water – omitting the brandy entirely. Without the preservative, you'll need new formula more often, but if alcohol sensitivity is a real problem, it will be worth it. Do You Drive Yourself Crazy With Indecision? We all have times when we simply can't decide. It might be a big issue – like whether to accept a marriage proposal or switch careers. It also might be something small – such as what to wear today, what to cook for dinner, or which movie to see. It's normal when it happens now and then. When it happens so often that you annoy yourself, you're suffering from a negative Scleranthus state. In addition to annoying yourself, you might be missing opportunities by failing to take action, and you might be annoying friends and family as well as yourself by constantly asking for opinions, making decisions, and changing your mind – endlessly. So make one simple decision to do something about it. Visit FeelBach! and place an order for Scleranthus. The Scleranthus Essence from FeelBach! can get you back in balance - so you can make wise decisions – and not change your mind ten minutes later. Today a whole lot of people are feeling like there's just no use. The economy is terrible, good jobs are scarce, and no one knows when or if that's going to change. But of course that's only the financial side of it. Most of us can look at our lives and even if we don't have all the money we want, we still have good lives. Most of us have enough to eat; we have a place to sleep and clothes to wear; we have people who love us; and we have a hundred small pleasures every day, if only we open our eyes and see them. Some people seem to have been born this way, but usually this negative state comes as the result of circumstances. It might be caused by the state of the economy, unemployment, illness, or the loss of a loved one. Children who are unhappy in school often fall into this state, as do elderly people who are forced to move to a care facility. If you're having trouble seeing that good side of life, try Gentian. Gentian is the Bach Flower Remedy that brings a return to faith – in God and the Higher Self, and in the meaning of life. The Feel Bach! Flower Essence Gentian won’t change a skeptic into an optimist, but it will allow him or her to see that a positive outcome is possible – and it will allow them to once again enjoy the company of friends and family.